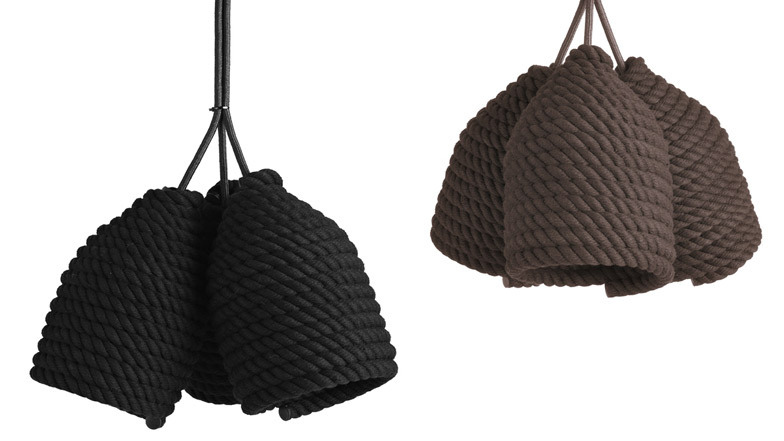 Ukrainian designer Vasiliy Butenko has made a series of pendant lamps by wrapping cotton rope around plastic bottles. Called Acorn, each one has an LED light source and comes in black, brown or blue. Photos are by the designer. Cotton rope is a simple but quite interesting and pleasant material. The majority of objects crafted with the use of the rope are woven, which makes the object manufacturing process more complicated. My intention was to create an utmost simple and modern object avoiding the use of complicated weaving techniques. In order to create volume of the illuminator, I used the bottle, which in my opinion had the best shape to fit in. Having bonded all the layers, we created a compact, light and neat illuminator shape without a frame. Given that the shape is very simple, I tried to consider every detail. I used LED bulbs in this illuminator as they provide integral and concentrated light, which enables to zone space the illuminator is hanged over.